1. For time away from my daily routine. For using my brain differently. For sleeping in. For reading a book in two days. Not a pamphlet, I said a book. Don’t be fresh. For growing up a little bit more. For growing away from some things, and towards others. Like a dilapidated sapling, bending towards the light. 2. For noticing things, and for the gifts I receive in doing so. For the scent of pine wafting from city tree lots as my husband and I walk hand-in-hand down Amsterdam Avenue. For the way my father says “honey” or “sweetheart” or “babe” on the phone with me when he’s in a good mood. For the restored brass-caged ticket booth at the front facade of the Beacon Theatre. For old signs and pressed tin ceilings in outerborough bakeries. For the fact that I can look up offhandedly on a street corner say, “That’s the Ansonia,” and tell my husband about the small farm once kept on the roof a hundred years ago, and that the Continental Baths were once in the building’s basement — and keep old New York alive if nowhere else but in tender, small places within me. For sitting in a 1920s-era high school auditorium and listening to a dear friend play violin at a local holiday pops concert, while closing my eyes, and feeling the swell of the Blue Danube Waltz. For that silent space between the awful thing being said, and the recipient’s response. For the tilt of a drunken man’s face, and the recognition of my femininity in his watery gray eyes, as I tuck a lock of hair behind my ear. For the twinkle of Christmas lights, sudden and bright, and still magical when they first appear in the darkness. 3. For this passage from Ann Patchett’s “Truth & Beauty,” which I devoured over the weekend. A blog re-run. For New Yawk. For the seventies. For summ-uh. It was hotter than hell on July 13th, 1977. It had been hotter than hell all day, and the evening dusk brought no relief. But this was how summer worked in New York City. I was about to turn seven, and I already knew this. I was alone in my parents’ bedroom, watching the black-and-white television set they kept on their dresser. My parents had recently purchased an air-conditioning unit for their bedroom window, which was a luxury item for their meager bank account, and a fairly modern convenience for most New Yorkers. My earliest memories of summer sleep were becoming obsolete in the face of air-conditioning. July lullabies of adult midnight chatter and laughter from cool brick stoops had morphed into the soulless hum of air-conditioning units, rendering my Each summer saw more grey metal rectangles — emblazoned with the word “FEDDERS” — appearing in oddly patterned intervals from apartment houses and two-family homes. Condensation dripped on my head in the street wherever I walked, or stained my Nike fabric sneakers when I rode in the front seat of my father’s beat-up Toyota Celica. That same year, I often stood in front of my grandparents’ window unit in their Queen dining room, which wheezed at full blast in a herculean effort to cool the entire first floor of their home. I’d stand like I was crucified, arms extended and eyes closed, until someone would yell that I’d catch my death of cold or pneumonia, or get a stiff neck, something. Get away from it. Get away from that thing. It’s too much on you. We could only afford one air-conditioner in our apartment — the one teetering on wood slats from my parents’ bedroom windowsill. I only had the pleasure of a box fan in my bedroom — which dutifully whirred and hummed, but was no match for New York summers. The fan often served as evening entertainment for me, as I breathed “ahhhhhhhh” through the turning fan blades, and delighted at the changes the air pattern made in the sound of my own voice. On July 13th, 1977, I was watching my parents’ black-and-white TV set from the comfort of my twin mattress, which had been placed on the floor at the foot of my parents’ bed, and that this was definitely a special occasion. It had to be. I was only allowed to sleep in my parents’ bedroom a handful of times, only because it was above ninety degrees by 11 pm, and because my mother had pleaded with my father out of concern for my health. (I should be 5’6″, but the dehydration stunted my growth.) I was heartbroken at the sound of their bedroom door closing on other nights in the summer, while I thrashed and sweated underneath a scratchy poly/cotton Raggedy Ann & Andy bedsheet. If I sound bitter, it’s because I am. Two years later, my father would redeem himself by custom-installing a window unit in my bedroom. He actually had to hire a mason to cut through my bedroom wall and the exterior brick facade to install it, since the narrow casement windows of our sweet Tudor house couldn’t accommodate such a modern device. All was forgiven. Thanks, Daddy. But in 1977, I sweated all night. And all freakin’ summer. I know I was by myself that night, because I was watching “Eight Is Enough.” My father hated “Eight Is Enough,” and I wouldn’t have been allowed to watch it if he was with me. For some reason, that night I was given a cool, comfortable pardon, and left with the black-and-white TV all for my own viewing. I remember next that the lights went out in the bedroom, and I stared at the TV tube while it did that “boo-whoop” thing it used to do, and that white light on the screen got smaller and smaller until it disappeared. But it didn’t boo-whoop like it usually did. It was quick and fast and gone, almost before I had even realized what was happening. My first thought was that The Son of Sam had something to do with this and was coming to get me. It wasn’t a frivolous thought. It was an immediate, panicked belief. He was everywhere that summer, it seemed, and he was capable of anything. I’d seen the news reports from Bill Beutel and Roger Grimsby on Eyewitness News while watching with my parents. New York City seemed to talk of nothing else that summer. We walked down the long hall towards the front door of our two-family house on 74th Street, and my father opened the door. The entire street was dark. Even the streetlight was out. A sight I’d never seen before as a city kid. (It took me years to be able to sleep in complete darkness. Probably why I’m nearsighted.) The air was still. And still hot. Neighbors ventured outside and sat on their stoops. They gathered together near transistor radios and citronella candles. Beer bottles and soda cans soon collected on the steps, as their laughter grew louder. I was sent to bed, probably because of the disturbing reports on the radio about looting. I lay by myself in the dark, in the slowly dissipating cold air of my parents’ bedroom, and fretted about the Son of Sam for a few minutes, until I had convinced myself that he couldn’t get me. Not with all of my neighbors safely keeping watch outside, whose voices rose up as in July lullabies past, co-mingled with the tinny music from a transistor radio outside. I soon fell asleep. The power was still out the next day, and my parents couldn’t commute to work. There would be no electricity once they’d arrived at their offices, even if they could find a way to get into the city. I turned on the color TV in the living room at least a dozen times, each time forgetting about the blackout, until my mother yelled from the kitchen that I’d break it. She kept talking and worrying about the people stuck in the subway cars under the East River during the blackout. I didn’t know anything about the looting that had gone on the night before. I didn’t hear about it until weeks later. I don’t think I fully understood what looting meant at the time. I just knew that people were scared. 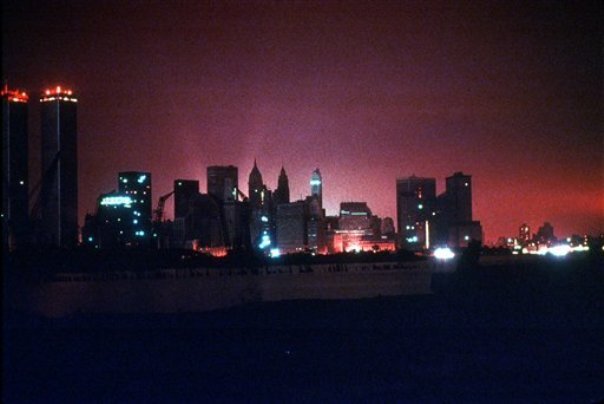 The blackout happened thirty-eight years ago this July — a summer for the New York City record books. this August — in a New York minute.